He loves his food so much he even dances on his dish for more! 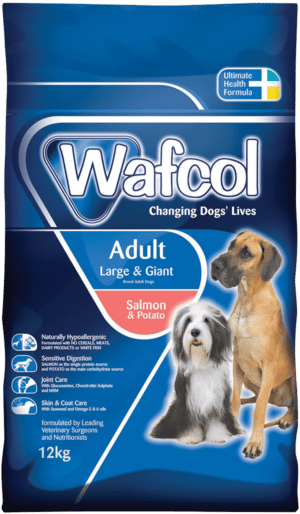 Wafcol Salmon and Potato for large breeds has completely changed our labradoodle Fletcher’s life. After a problem when Fletcher was a puppy he was left with a number of food intolerances. Fletcher was extremely poorly due to his body rejecting all other forms of food, eventually after recommendation from a vet we tried him on Wafcol and he has never looked back. Fletcher has gone from strength to strength and is now a happy healthy dog and all thanks to Wafcol! He loves his food so much he even dances on his dish for more! Thank You Wafcol for giving us our happy chappy back.